Honesty. Hard work. Fair play. A company founded with principles. Our level of driving experience is far above the national average, and we are very proud of our hiring standard. This experience level combined with our operational ability leads to a higher retention of our driving force. We operate in all 48 states with East/West, East/Northwest, and Southeast lanes. We have something for everyone. 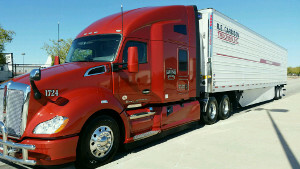 Join our team and start your truck driving career. R.E. Garrison Trucking is now accepting driver applications. R.E. Garrison Trucking, Inc. was founded over 50 years ago by Mr. Roy Garrison. Mr. Garrison started with one truck, transporting poultry to the West Coast and bringing produce back to the Southeast. Though Roy is no longer active in the trucking industry, he built this business on the three basic principles of hard work. honesty and fair play. Each of us at R.E. Garrison relies on those principles to this day. Contact us at +1 (256) 255-5500. When a customer entrusts their product with us, we owe them clean, well-maintained equipment manned by courteous, commercial driving personnel. At R.E. Garrison, we are determined to bring you the highest standards of quality in all of your carrier needs.